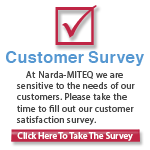 L3 Narda-MITEQ's constant transmission phase-limiting IF amplifiers are intended for use in frequency and phase measurement systems. The primary function of these amplifiers is to preserve insertion phase shift while maintaining output power over a wide input dynamic range. In phase measurement systems, the phase and output amplitude matching of two or more units, becomes a critical parameter. Repeatability in manufacturing and testing of these components is essential to guarantee identical insertion phase of each. Depending on the location within the signal path, frequency measurement systems may also employ more than one limiting amplifier per system. As in-phase measurement systems, attention to matching of phase and amplitude is critical to ensure measurement accuracy. Not all fields are required. Partial Model numbers may be entered. Another critical parameter of a constant phase-limiting amplifier's performance is the phase settling time. Under RF pulse modulation, matched sets of amplifiers must exhibit identical phase settling time; otherwise differential phase errors introduced can be misinterpreted as a difference in phase angle. Phase variation and differential phase (matching) is measured using a vector voltmeter and a calibrated CW (continuous wave) RF source. A desktop computer is used to control the instrument and collect the data. The result is a plot of phase shift versus input power level. Pulse performance of limiting amplifiers is verified in a similar manner as in testing logarithmic amplifiers with the exception that the pulse-modulated RF envelope is displayed on the oscilloscope. Typical measurements of an individual unit are rise time, delay time, overshoot and ringing (expressed in dB) and recovery time. To test matched units for phase settling time, a different setup is required. This typically consists of two limiting amplifiers driving a double-balanced mixer being used as a phase detector. Careful calibration is necessary to ensure proper drive levels are provided to the mixer. An in-phase power divider delivers the pulse-modulated RF to the inputs of the limiting amplifiers and the resulting video output (from the IF port of the mixer) is displayed on an oscilloscope. Typical measurements are overshoot and ringing and Settling time to a specified percentage. Phase settling time measurement is an important parameter in systems using matched constant phase-limiting amplifiers to drive I/Q demodulators or phase detectors. Since 1969, L3 Narda-MITEQ, the pioneers in Amplifier development, have been customizing to our customers specific requirements. This can include new design efforts, modifications to existing designs for performance and mechanical needs, as well as additional testing and environmental screening. 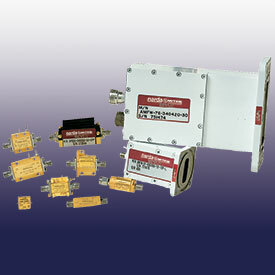 3-Year Warranty and most are available as RoHs Compliant components.